So, bear with me, please. I appear to be moonstruck. I’m not at all surprised. I just finished Robert Johnson’s book, Owning Your Own Shadow: Understanding the Dark Side of the Psyche, and I’m headed off in the morning for a two-day class on personality type development where I get to dive deeply into that very subject. It’s on my mind right now. 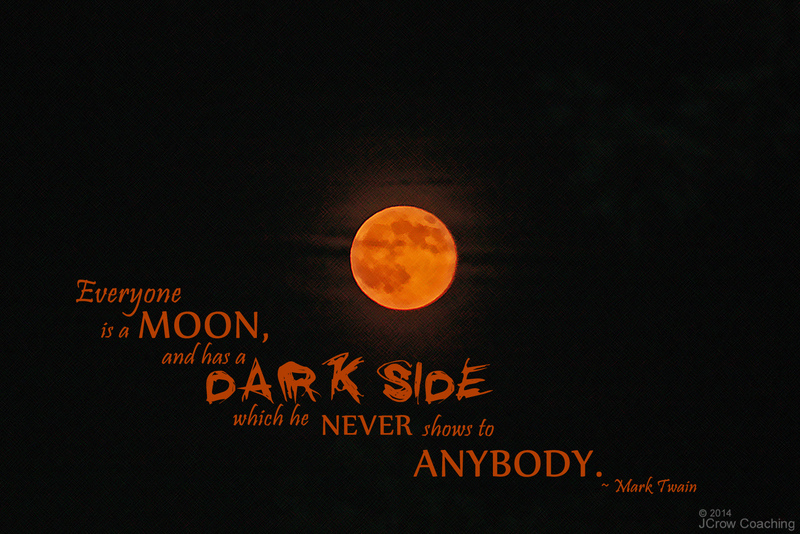 Tonight’s supermoon, all orange and glowing in the sky, pulled me back along with my camera tonight. And what I realized as I snapped photos and absorbed its beauty in the sky is that it may be a super bright moon, but it nevertheless has its dark side, which it never shows to anyone — at least to anyone here on earth. So I’m thinking about that, which leads me to consider how we never fully know another person, really, which subsequently hammers home the reason: we never fully know ourselves, either, so how can we ever expect to fully know another being? We, too, have a dark side hidden from view and buried deep in our unconscious minds. Now, as Johnson (a Jungian scholar) writes, it’s literally our life’s work to discover those shadowy places and light a candle or two, then begin working to balance that dark matter of ourselves with the light matter of our awareness. It’s Yin and Yang for each one of us and, if we are to grow, develop, and become more whole, then by God we’ll do the work that’s required or it will be a life of harassment by that dark shadow side. But I’m a curious soul, and I prefer to dig in the dark to find answers, no matter how difficult the task may be. So this lovely, orange moon in the night sky above my backyard speaks volumes in its relentless journey toward the West. Just because I also have that hidden, shadowy dark side doesn’t mean I have to hide it. I’m luckier than the Man in the Moon: I can dig and search, prod and ponder what arises from my subconscious. I can light a candle, spread a little light of awareness, and utter an “aha” when a glimmer of understanding worms its way into my conscious mind, allowing me to own a little more of that shadow personality. With every aha, the balancing act gets a little easier, and I learn far more about myself than I ever knew before. Grateful for this summer of Supermoons. They’re piquing my interest and sending me digging for gold. I’m liking it.